I’ve been on something of a celebrity memoir kick lately (for instance, right now I am reading Tori Spellings’ memoir sTori Telling. I love that name. It is amazing). 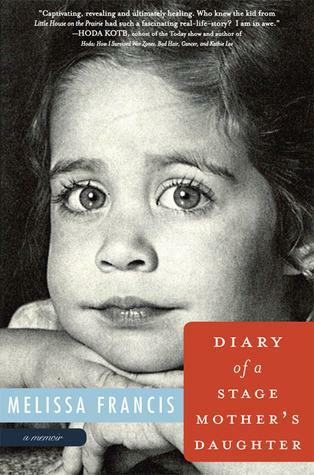 And one of the best, so far, has been Melissa Francis’ Diary of a Stage Mother’s Daughter. It’s the memoir of a Fox News anchor who, as a child, played some character on the show Little House On The Prairie. Most celebrity memoirs fail because the celebrity has too wide a threshold. They think that the mundane details of their life are important and interesting simply because those details include outrageous things that would never happen to any of their readers. But they are wrong. It is not enough to simply write about the time you chopped off a panda’s ear and ate it. You also need to put in some kind of narrative. And that means rising action, cause and effect, the whole bunch of lies. The best memoirs seem to be the ones that concentrate on one thing and trace it through the memoirist’s life. In the case of Melissa Francis, that thing is her awful stage-mom. This mom probably isn’t the worst stage-mom in the world, but there’s a weird, shimmery quality to her. She is outrageously self-absorbed, but she’s also very brittle and hapless. The family is at her mercy, but she’s a paper tiger. For instance, she seems so weirdly, genuinely happy whenever her daughters book a deal. She looks out for them when they’re on stage, helping them rehearse lines and book the right costume. Stage mothers are supposed to be monsters through and through. But she has a weird, serpentine humanity to her. I think what the book gets right is the strange codependency that parents can develop with their children. To the child, the parent is completely in charge. But when a parent decides to invest so much of his or her sense of self-worth in the child, then the child has a lot of power over the parent as well.